Box Text: BOND IS BACK. Blending first-person shooting and third-person action, Quantum of Solace puts you in control of Bond’s greatest weapon - his mind. Enter the ruthless world of international espionage through the single-player story, or test your secret agent skills across the globe with a variety of 12-player multiplayer modes. Use your MI-6 training in high-octane combat, explosive shootouts and stealth close-quarter take downs. 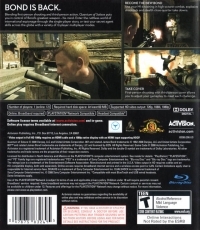 First-person shooting with third-person cover allows you to adjust your gameplay to meet each challenge. 09-20-2017 silverbow Box Text BOND IS BACK. 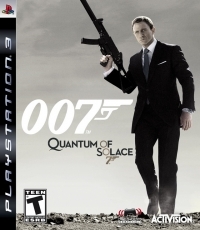 Blending first-person shooting and third-person action, Quantum of Solace puts you in control of Bond’s greatest weapon - his mind. Enter the ruthless world of international espionage through the single-player story, or test your secret agent skills across the globe with a variety of 12-player multiplayer modes. BECOME THE NEW BOND Use your MI-6 training in high-octane combat, explosive shootouts and stealth close-quarter take downs. TAKE COVER First-person shooting with third-person cover allows you to adjust your gameplay to meet each challenge.